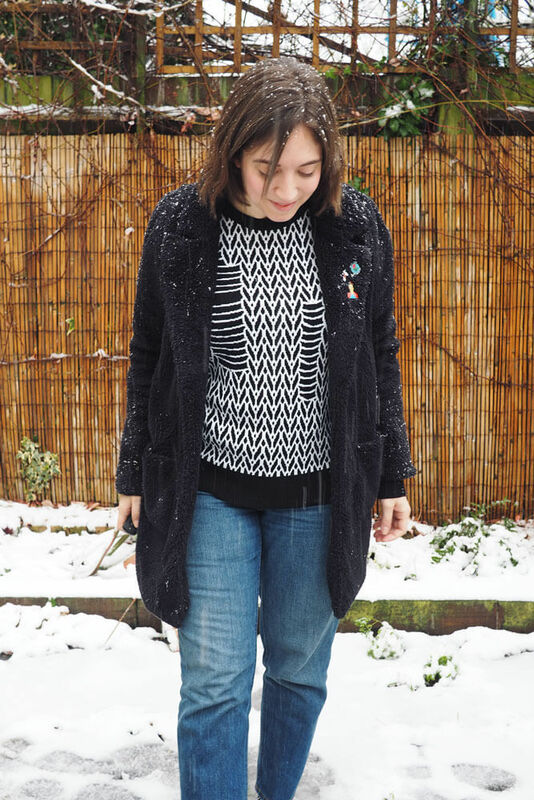 Another coat project for a snowy day! 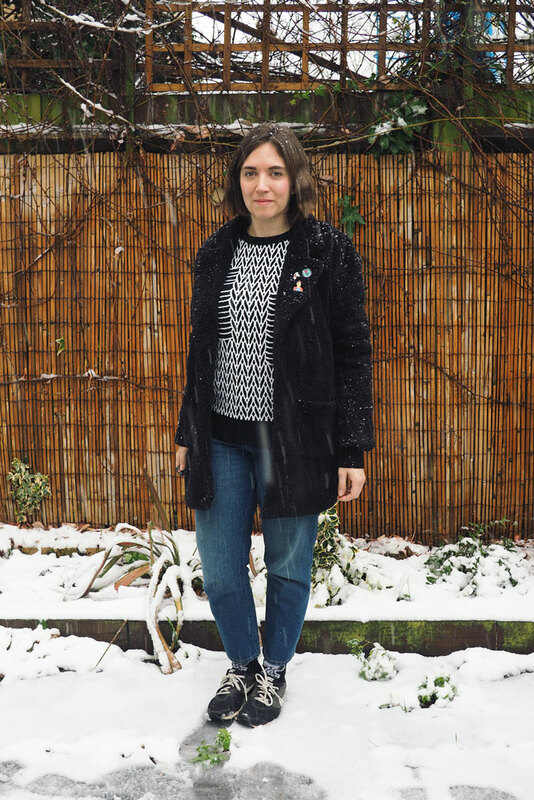 This was a real impulse sew and perhaps a bit trend-led, but I really wanted a fluffy coat to call my own after seeing them on some of my friends and general cool girls around London and Instagram. 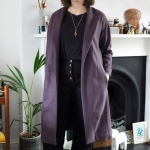 Plus my Freemantle is a bit statement-y so I wanted a plainer and shorter coat for some variation. 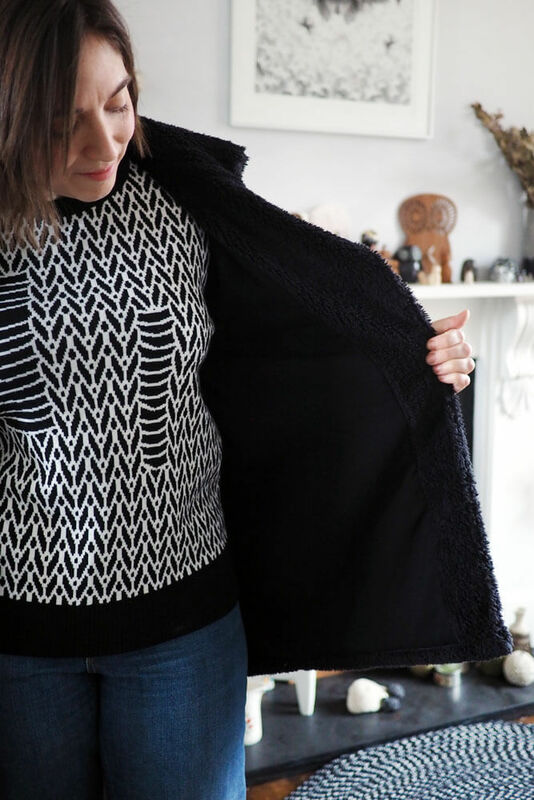 I was tempted to buy a new pattern – the Oslo, Marcelle and Silvia were all contenders – but decided to rad my stash instead and reuse the Named Yona pattern which I made two winters ago. I do still really like that first Yona but the more tailored-looking finish doesn’t seem to be so much my style any more. Luckily it’s a real chameleon sort of pattern depending on fabric type so you wouldn’t really even think they were the same base pattern. 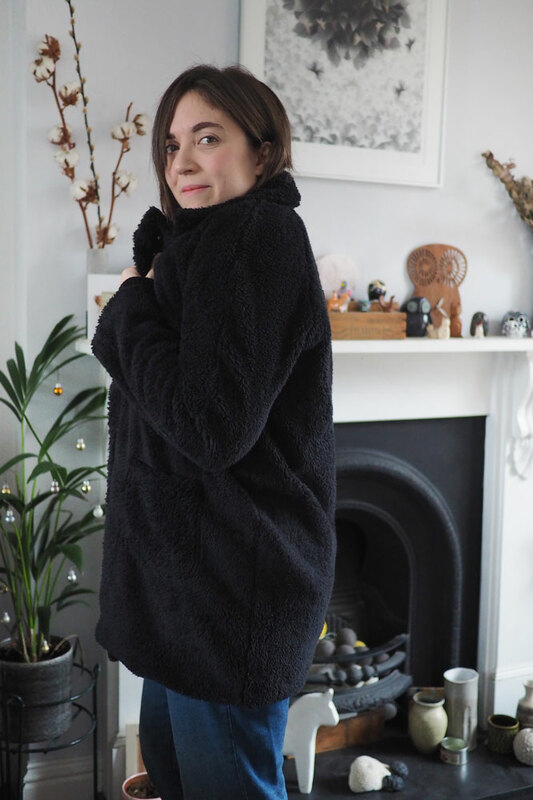 I used a faux-sherpa fur fabric from Minerva which is sold out in black but still available in some other shades. 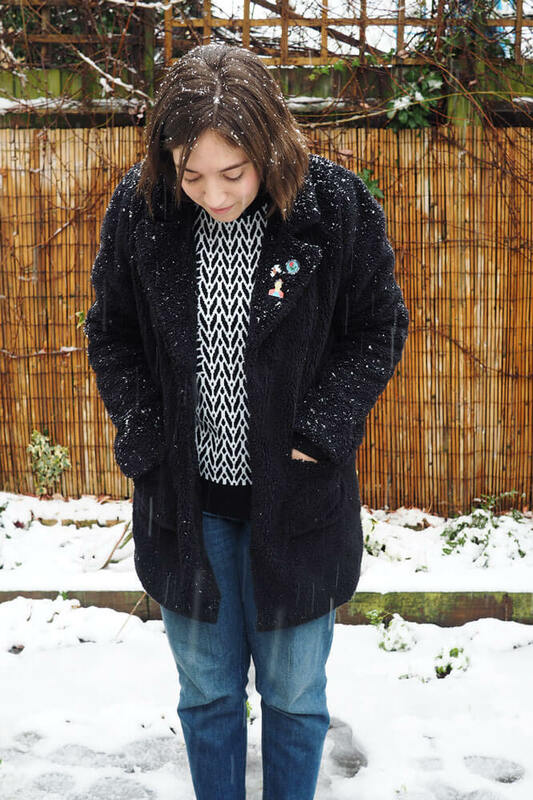 The wide lapels are perfect for a few of my favourite pins, which help it read more indiekid than P Diddy, ha ha. The lining is a simple plain black viscose also from Minerva. Practice really does make perfect and this is my nicest bagged lining insertion yet. The fur fabric is, as accurately described, quite stretchy and drapey so after consulting Instagram I decided to block-fuse it before cutting for my coat. If you haven’t come across the term before, block-fusing is where you iron interfacing onto your entire yardage before cutting out the pieces. I used a high quality knit interfacing from English Couture. The ironing process was tiresome as hell and took ages, but definitely gave the fabric a much more appropriate heft and handle will still retaining its softness. 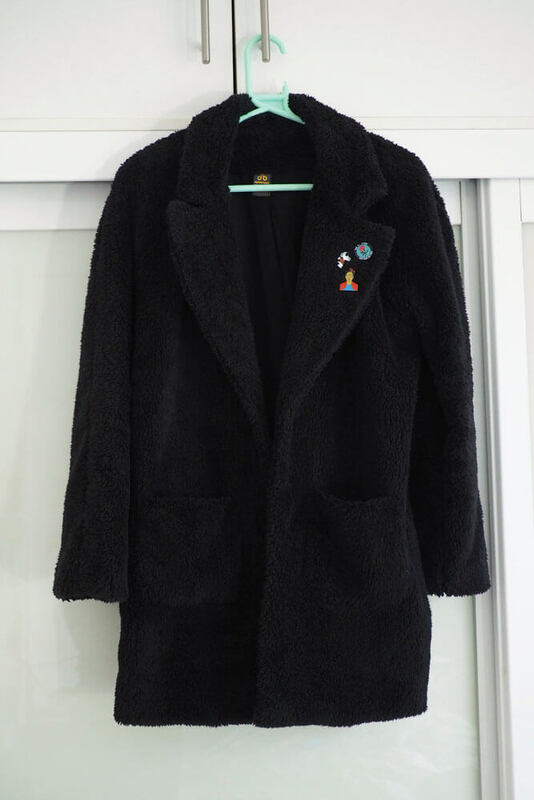 The coat feels really secure and like it will hold its shape for a good time so it was worth the effort. I made sure to line everything up in the same direction, with the nap running downwards, as the fabric has a slight directional pile. I found the easiest cutting technique was to fold my fabric with the wrong side facing out, pin the paper pieces in place then cut with my rotary. After cutting I shook each piece to remove most of the loose fluff then vacuumed it all up before I started sewing. I was advised on Instagram that a spin in the dryer removes all the excess effectively, but I didn’t try this. 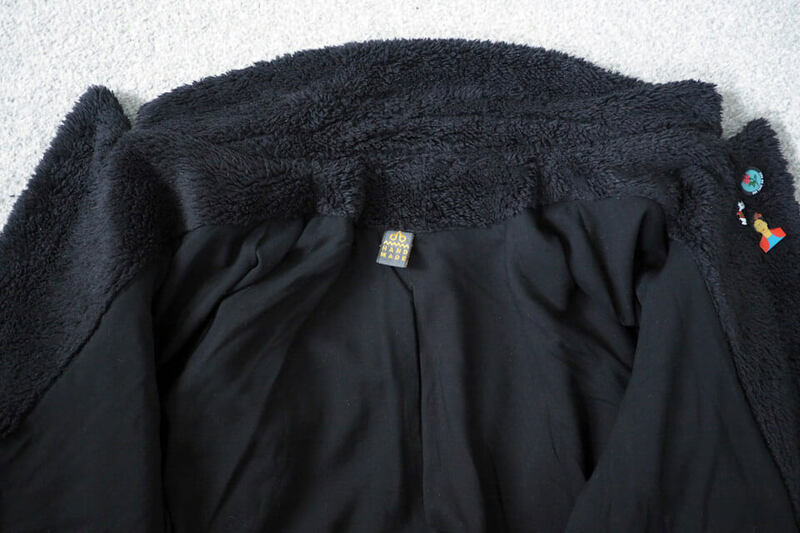 I used pins instead of snipping notches as they would have got totally lost in the pile. After sewing seams I trimmed them down and pressed open first from the wrong side (with a cloth to protect the interfacing) then gave a shot of steam from the right side and pressed a clapper over it. I don’t have a proper clapper, but my sleeve board works weirdly well for this purpose! Then I fluffed the pile back up and brushed it over the seam. I used a walking foot to deal with the bulk and prevent the layers shifting, and used wonder clips instead of pins. As my fabric maintained a slight stretch, I selected a zigzag stitch to prevent seams from potentially popping. Luckily having sewn the Yona pattern before, as well as another coat recently, the sewing itself went really fast. 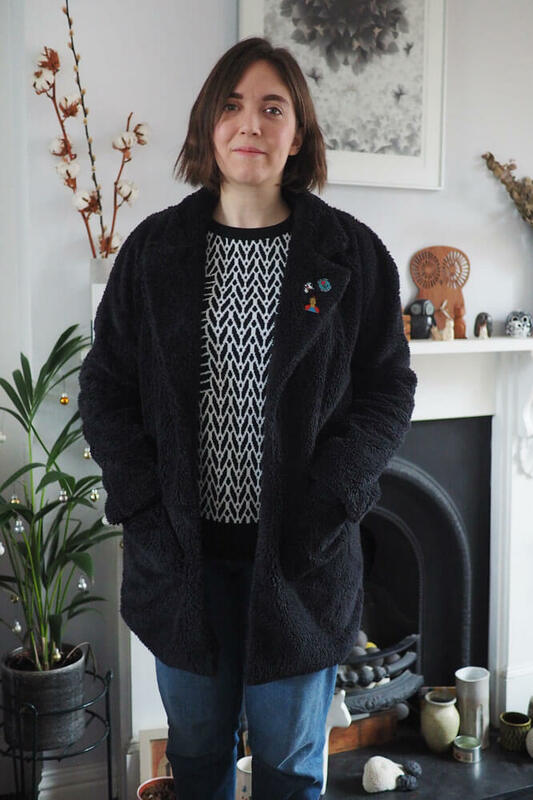 The entire project was finished in one day, which might sound a bit mad but the Yona is actually a rather simple coat overall with no fastenings, easy-to-set raglan sleeves and patch pockets, and really good instructions for bagging out the lining, so I’d definitely recommend it to anyone looking for a first or speedy outerwear project. 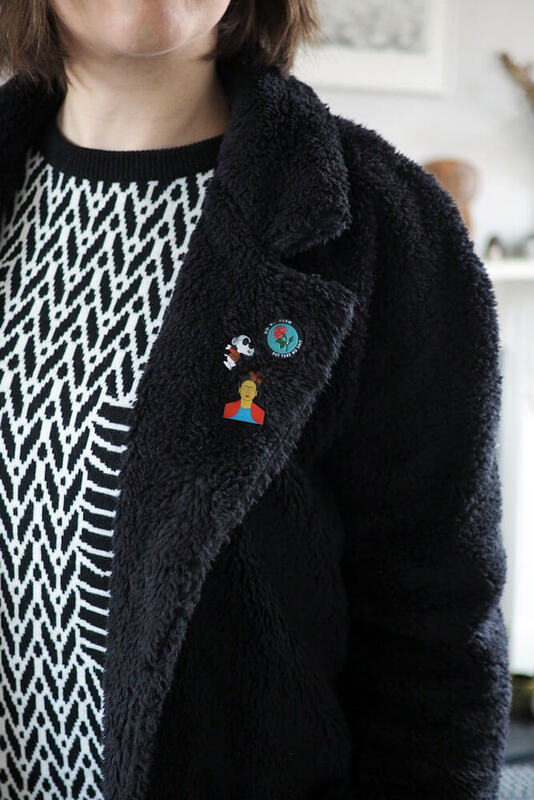 I adore how this coat turned out! I only wish I had firstly made the pockets a bit bigger so I can dig my hands properly into them (my Freemantle has huge pockets and I basically use them as a glove substitute) and retrospectively I might have thought about extending out the centre front into a little overlap so I could add a snap fastening or two. Nonetheless it’s extremely cosy and warm, so I look forward to rotating both coats throughout this winter. Thanks! I really recommend this pattern. Thanks – keep at it! This coat is absolutely amazing! Lovely. Think the Oslo would be nice too – next project maybe? I don’t think i need another coat now, but maybe next winter!